Tragedy has struck the St Clair County Sheriff office four times over its existence. Each one of the men listed below gave the ultimate sacrifice for the people of this county. 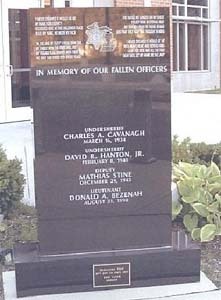 The above memorial was dedicated to them on September 15, 2005. It sits in front of the Intervention center so that all that enter are reminded of the price that was paid by these brave men. Undersheriff Cavanagh, along with Sheriff VanAntwerp and two deputies responded to a man with a gun call on the south side of Port Huron. When Cavanagh approached to remove a gun from the suspect’s waistband, he produced another weapon and shot the Undersheriff. In the resulting gun fight, the suspect was also killed and five other subjects wounded. The suspect, Herbert Youngblood, had been linked to none other than John Dillinger. Underseriff Hanton and Assistant Prosecuting attorney Richard Holt, were enroute to investigate reports of beer gardens remaining open after hours. Distracted by oncoming headlights, Holt drove the vehicle into the rear of a semi trailer. Both subjects died as a result their injuries. Deputy Stine was killed as a result of a traffic accident involving a train. Deputy Stine and his partner, Deputy Ralph Schlee were transporting two for disorderly conduct. One of the suspects claimed to have a knife. Distracted by the suspects, the patrol car struck a train. 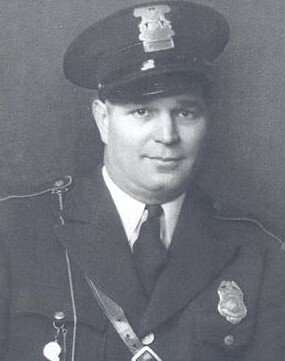 Deputy Stine and the two suspects were killed in the collision. Lt. Bezenah, the commander of the Marine division, was on patrol when a request for assistance came from Macomb County. Macomb was in pursuit of a boater for reckless and intoxicated operation of a watercraft and also fleeing and eluding. During the chase, the suspect intentionally rammed the Lt’s boat, killing him instantly.